When the arts and crafts movement hit the Midwest in the late nineteenth century, it dramatically influenced architecture, interior design, and home furnishings. Elements of the original arts and crafts ideal surface in Oak Park property in its neighborhood houses, and in contemporary arts and crafts designers, restorers, and antique arts and crafts dealers. Craftsman houses are known for the interior built-ins, including cabinets, shelves and seating, superior carpentry, lots of lead-glass and stained glass windows, and dark wood wainscoting and moldings. Many craftsman houses have beamed ceilings and open floor plans. They have wood, stone or stucco siding and are known for low-pitched roofs and the overall horizontal shape. Craftsman bungalows are part of this genre in Oak Park property. Throughout the town, home buyers can locate craftsman details in houses of different architectural designs. Ideal Location Chicago Real Estate’s broker Eli Schultz, who grew up in Oak Park and lives in the neighborhood with his family, offers expertise in helping you find the right house in Oak Park Real Estate. 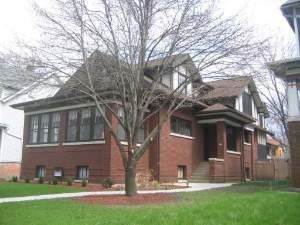 Whether it is a Bungalow, an American Four Square, Victorian or a Prairie-style home or one built in the other architectural styles that make this community historically significant and desirable to successive generations, Eli Schultz can provide the details and assist you in making Oak Park the location of your next home. Since the days of Frank Lloyd Wright, the Gunderson Brothers, and E.E. Roberts, to name just a few of the architects and builders of this community of excellent schools and parks, residents and town government have worked to maintain excellent municipal services and preserve the integrity and value of Oak Park Real Estate. Oak Park is conveniently located with transportation connections to downtown Chicago by rail and El.